What is the origin of the Art? The origins of Boabom are in ancient Böd (Himalaya), it was part of a family tradition. Currently the Boabom Council is responsible for developing and teaching these Arts, irrespective of culture, country, race, or religion. What does the word “Boabom” mean? “Boabom” is a protective mantra and implies “internal defense”, “power”, “protection”, “inner energy”, “vitality” or “osseous force” (at the same time, flexibility and solidity). Does Boabom have a founder? In what year was founded Boabom? Boabom does not recognize a founder or a precise time of creation, the old stories about its origins talk about a mythic time, before this era. What are the goals of Boabom? The Boabom is an Art of physical and mental development, and his goals are the self-awareness, the equilibrium and to help the student to attain an optimal state of health, energy and vitality. Whoever is interested can learn this Art by coming to our Schools or contacting our Teachers and taking a regular course; for that purpose, simply write to [email protected]. It is also possible to participate in one of the Seminars that take place in different parts of the world. Finally, there are also books about Seamm-Jasani and Boabom, which are available in several languages. Is there any grand Master or leader of the Boabom Schools? 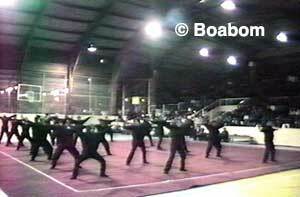 There is NO concept of “leader”, “master”, and least of all “grand master” in the philosophy of the Boabom Arts. On the contrary, Boabom is guided by a Council which is formed by all the Boabom Teachers, wherein the senior teachers are in charge of preparing the new apprentices. No. Boabom is an Art and thus a form or universal technique that can be learned by and fruitful for anyone, regardless of her/his race, political position, or religion. In fact, the students and teachers of Boabom belong themselves to varying countries, cultures, and lines of thought. Is Boabom a Secret Art? Boabom is not a Secret Art in the sense that it is open to everyone who has a sincere interest in learning and developing it. Traditionally, it was an Art that was taught in a family or to a limited number of students. However, currently there are Schools and books regarding its development and anyone who has a real interest in learning it is welcome! What is the difference between Seamm-Jasani and Boabom? Are they the same Art? Seamm-Jasani and Boabom are part of the same teaching; the Mmulargan-Boabom. But, Seamm-Jasani includes slow and gentle movements; it focuses primarily on relaxation and functions as a therapeutic technique: we also call it Soft Boabom. On the other hand, Osseous Boabom or the Art of Defense, is formed by movements that are much faster and stronger, where the main goal is defense itself and to create a state of security in the student. Seamm-Jasani and Boabom are totally independent classes (or courses); a student can learn both at the same time or choose to pursue only one of them. What is Yaanbao? Is it also Boabom? Can I learn only Yaanbao? Yannbao is part of the Mmulargan-Boabom teaching. But, Yaanbao is an independent branch of these Arts, yet it is linked to Boabom. It can be called Boabom of the Elements, for it works exclusively with various elements, such as medium, long or short poles, as well as other forms. In our Schools, it is a requisite that the student has at least 5 months of training in Osseous Boabom (1st stage) in order to start learning Yannbao, which then proceeds as an independent course. How much time is needed to learn Boabom, Seamm-Jasani or Yaanbao? What is the meaning of Mmulargan? Mmulargan has many connotations: it can be translated as “School”, “the foundation of the teachings”, or “the circle of Students and Teachers of Boabom Arts”. It is also a formal term referring to the Boabom Schools when they have reached a stable development. Finally, Mmulargan is a word that involves the development of the essential program of Boabom and its branches, including more than 8,000 movements and forms. But, is Boabom a Martial Art? The Boabom Council does not consider Boabom a Martial Art, but rather an Art that integrates relaxation, meditation, and defense into a coherent whole. The basic concepts of Martial Arts (tournaments, trophies, colored belts, competing or competitive combats, masters, venerate pictures of masters, breaking or hitting things, etc.) are totally foreign to Boabom. Is Boabom really an effective Art of defense? The technique of Boabom is highly effective as defense; of Boabom it is said that it is fine and invisible, so precise that in application it remains unseen. Nevertheless, defense is not Boabom’s final goal, but simply one of its manifestations. True defense lies in being secure in oneself and in one’s internal energy. What is Boabom good for? What are its benefits? Boabom has direct benefits in health, physical condition, security, vitality and psychological balance. A variety of articles as well as a study are available on this page. Must I use special clothing in order to learn? Only comfortable clothes are necessary. There is traditional Boabom clothing, but it is completely optional. Is there a minimum or maximum age for beginners? One can begin to practice Boabom from the age one begins to walk until the end of one’s life. If the students is over 65 years old, we will generally apply a special pedagogy that is gentler and specifically suited to the student’s physical condition. For small children we usually apply simpler and more playful programs. As with all forms of exercise, it is recommended that all students have a general medical exam before starting classes. How many hours a week are required of a Boabom student? Regular courses require only two hours a week, split into one-hour classes on two days of the week. Students with less free time can easily take only one class a week. The most important thing in the long run is constancy. Note: each School and teacher organizes their schedule independently, so it is best to consult them with more specific questions. Can I become a Boabom instructor and teach? Every student with a certain level of experience (4th stage of Boabom) can apply to join the pedagogic program of Boabom and thus begin her or his studies as Apprentice or Assistant-Teacher of Boabom. In order to do this, one must apply to special courses given in the different Schools, and be accepted by the Council; once accepted, one must renew one’s certification annually. How can I find out if there is a School or a certified teacher in my country or city? Simply write to [email protected]. We will contact you with information regarding the nearest Boabom teacher or School. How can I participate in your seminars? Such activities are announced in the Seminars section on this page. You can also write to [email protected] for consultations or suggest places to eventually organize a seminar. Can I ask you to offer a seminar in my country or city? A seminar requires only a minimum number of participants and a clean, empty space. It can consist of one to five intensive classes. The price per person will depend on the costs. For further information write to: [email protected]. Are there any books on these arts? Do you offer DVDs or videos? There are a variety of books that illustrate different facets of Boabom. The soft form of the Art: Seamm-Jasani; the Art of Defense: Boabom; Meditation: Bamso; finally, the origins of the Art: Mmulmmat. These books can be found in bookstores, or you can consult our Books section. At the moment no DVD or video on the Art is available.